ABOUT THE AUTHOR: Peter Hannaford has had a long career in American politics and public affairs. He is a former Reagan adviser and current senior consultant to APCO Worldwide, a public affairs/strategic communications firm based in Washington DC. 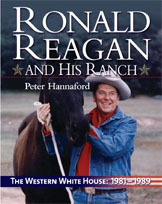 In Mr. Reagan's 1976 presidential nomination campaign, Mr. Hannaford was Director of Issues and Research; in the 1980 campaign, he was Senior Communications Advisor to Mr. Reagan. He also served as Assistant to the Governor and Director of Public Affairs for then-Governor Reagan in Sacramento. He is the author of eight books and numerous articles, columns, and essays.